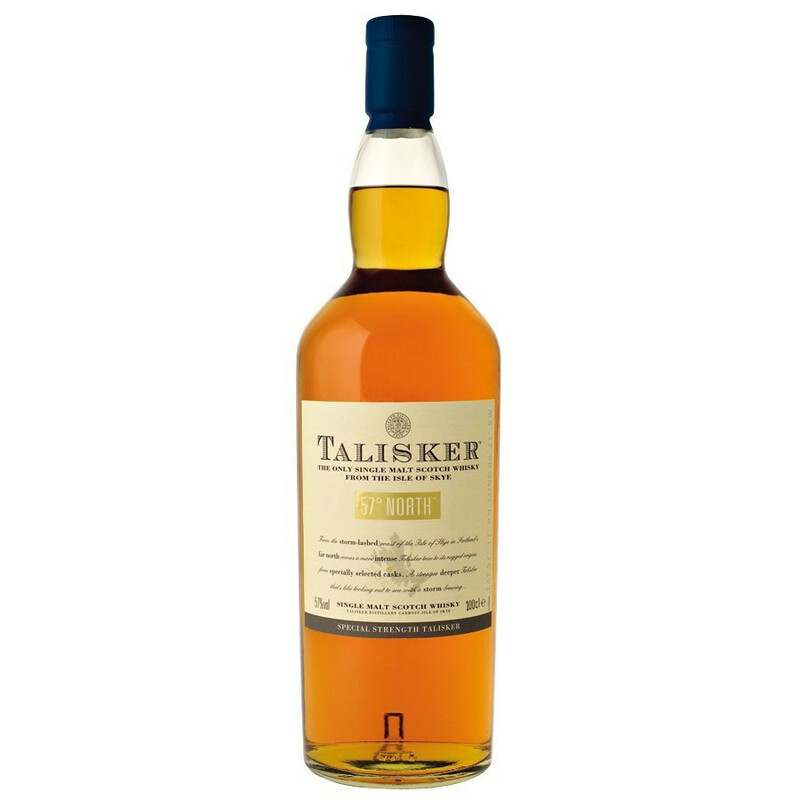 Talisker 57° North is an Island Scotch whisky of high alcohol content very much appreciated by whisky lovers. Talisker wished to strike the minds with this 57° North Scotch whisky. It is the ultimate Talisker expression, a whisky on the borders of the world, touching the most northern latitudes of Scotland at 57° North (as north as Alaska!) and extremely intense bottling at 57° ABV. A beautiful tribute paid to the distillery's masterful skills. To express the full intensity of the whisky, Talisker aged in carefully selected Bourbon barrels. 57° North is a combination of strength and depth, rumbling like an approaching storm. This impetuous spirit deserves a few drops of water to soften and unleash its whole range of aromas. A few miles away from the west coast of the Highlands sits the Isle of Skye, with its rugged coastline and windswept peat lands. The small coastal town of Carboast, on the shores of Loch Harport and on the foothills of the Cuillins, is nestled in a region battered by the winds and sea breeze, Talisker. This is where the only one distillery of the island chose to settle – one of the most prestigious and isolated of all. Back in 1825, Hugh and Kenneth Mac Askill decided to establish themselves on the Isle of Skye. They quickly grew fond of their adoptive region, and rented a plot in Carbost to build, in 1830, the Talisker distillery. Laden with salt, lava and peat, the distillery bottles exceptional Single Malts, known for their spicy, powerful character. Because of the unique character and quality of Talisker whiskies, the distillery features in the Classic Malts Selection. Created more than 20 years ago, this selection recognises Single Malts crafted in the tradition of iconic distilleries, and offers the most impressive whisky styles Scotland has to offer. Colour: gold with amber colour. Nose: evokes lighted matches, like an approaching volcanic eruption, over a bed of seaweed. Palate: a bursting, scorching attack of the high alcohol content, utterly smoky, intense, evocative of raw volcanic power, the one that gave birth to the mountain range of the "Black Cuillins", which rugged shape overlooks the Isle of Skye. A drop of water tones down the molten lava, appeasing the flow towards smooth notes, evocative of the peaceful hilly landscape stretching beyond the steep mountains. Finish: oily, medicinal and peppery. Amazingly well paired with smoked salmon, old Comté cheese and dark chocolate. An ideal digestive and accompaniment to old Beaufort cheese and smoked eel.